Our customers top picks for 2019! The Charred Oak gas log set by Real Fyre is our top-selling vented log set. Our customers love this set because the logs, flame presentation, and ember bed are incredibly realistic. They also love that it's a great value and very easy to install. 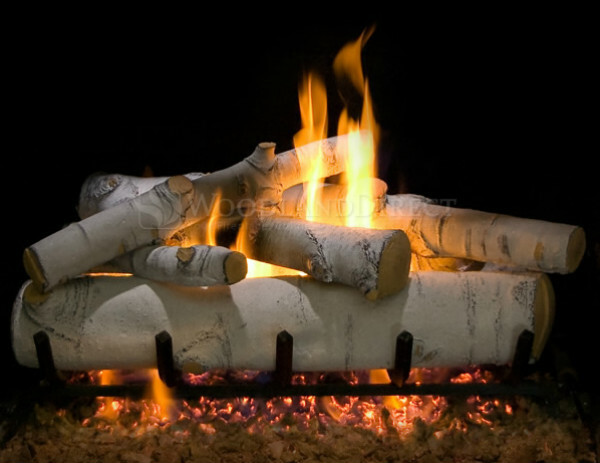 Real Fyre uses superior refractory ceramics to make their logs and reinforces each one with a steel rod, ensuring they retain their strength and shape at high temperatures. Each log is cast from actual wood samples then hand-painted to perfectly reflect the details found in the natural wood. These particular logs are given a charred appearance and the front log is split to make it look like the fire has been burning for hours. Available in five sizes with two burner options and multiple ignition systems to choose from, this set can be customized to find the perfect fit for your fireplace, lifestyle, and budget! Sierra Birch Logs by Northern Flame are designed to look like high mountain birch trees. Our customer’s love this set for its realism and the bright focal point it creates inside their fireplaces. Northern Flame uses highly detailed molds and a unique seven-step coloring process to expertly capture the intricacies of real birch wood. Each log is finished with hand-tinting, bringing the textured bark to life. Over time the logs develop natural-looking soot wherever the flame touches them, and the warm, radiant glow of the ember bed furthers the authentic appearance. Sierra Birch logs pair perfectly with monochromatic color schemes by blending seamlessly with a white fireplace liner and surround, or by adding a dramatic contrast to an all-black fireplace. If you’re looking to add rustic charm to your indoor fireplace, the Country Oak gas log set from Northern Flame is the perfect choice! Our customers love this set because it has beautiful coloring, it’s easy to install, and has a nice combination of log sizes. The ember bed perfectly accents the fire creating an alluring ambiance and furthering the natural look. Country Oak gas logs by Northern Flame are made with the same beautiful detailed molding and unique seven-step coloring process as the Sierra Birch logs above but are designed to look just like real oak trees. The light surfaces of the logs are accented by dark recesses and pitting, adding texture and depth to bring the bark to life. Each log is reinforced with a steel frame to ensure they don’t warp or crack under extreme heat. The Country Oak log set is available in five sizes with multiple ignitions systems to choose from, guaranteeing you’ll find the perfect set to compliment your hearth! The Arizona Weathered Oak gas log set by Grand Canyon Gas Logs brings the beauty of the Grand Canyon to your home! Our customer’s love this set because the rich detailing of the logs, beautiful flame presentation, and radiant ember bed create an exquisite display and offer unsurpassed realism. 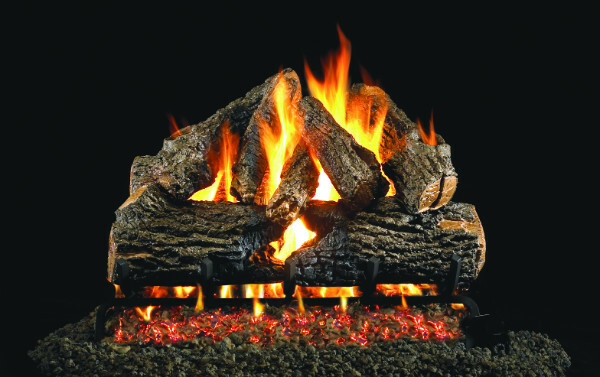 Grand Canyon Gas Logs has a team of Log Hunters who search the river banks of the Grand Canyon and Northern Arizona forests to find the most beautiful wood logs to create their gas log sets from. Each gas log is individually cast from their foraged logs then hand-painted to capture the unique characteristics found in the real wood. Made with refractory cement, Grand Canyon Gas Logs are extremely durable, providing the perfect balance between function and design. The Arizona Weathered Oak log set is available in three different sizes with multiple ignition systems and two ANSI certified burners to choose from. The logs can be placed over a bed of sparkling fire glass for a contemporary look or paired with optional twigs to add an even more authentic appearance. 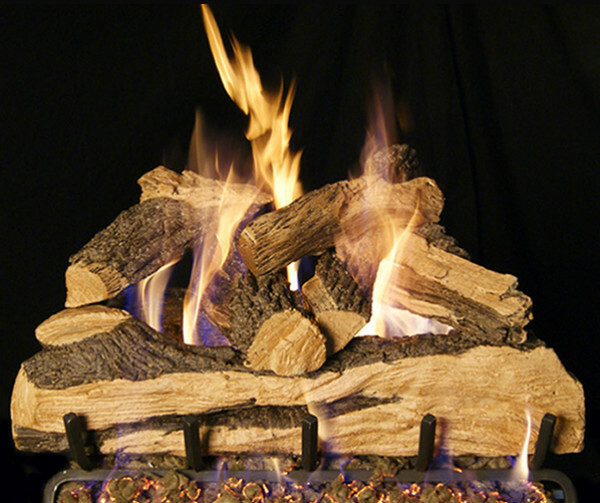 Split Oak Designer gas logs by Real Fyre are a customer favorite for their incredibly authentic appearance. The logs are beautifully crafted, easy to put together, and produce heat effectively. The high flames and captivating ember bed make it look like there’s an actual wood fire burning in the fireplace. Real Fyre makes Split Oak Designer logs with the same superior materials and attention to detail as the Charred Oak log set above. The hand-painted detailing of this set makes it appear as though freshly chopped logs were just added to the fire. If you’re looking for a truly authentic wood burning experience without the hassle of a real wood fire, then Split Oak Designer logs are the perfect choice for you! With four sizes, two burner options, and multiple ignition types to choose from, this log set gives you the ability to create a custom fit for your hearth, lifestyle, and budget! Head over to our Gas Log Buying Guide to learn even more about gas logs! 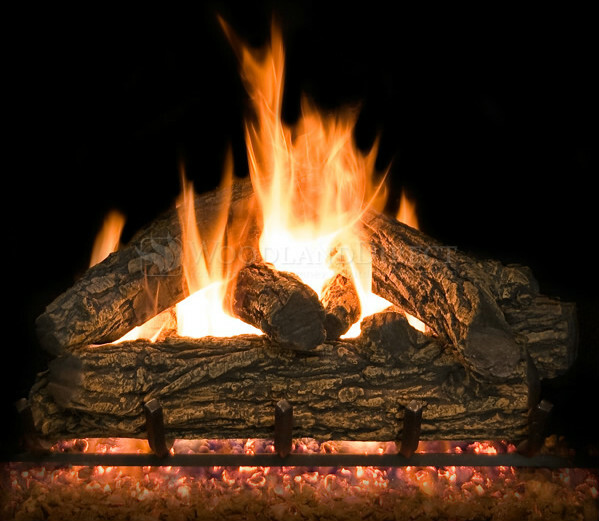 Check out our top 6 reasons why gas logs are a great alternative to wood burning fireplaces! 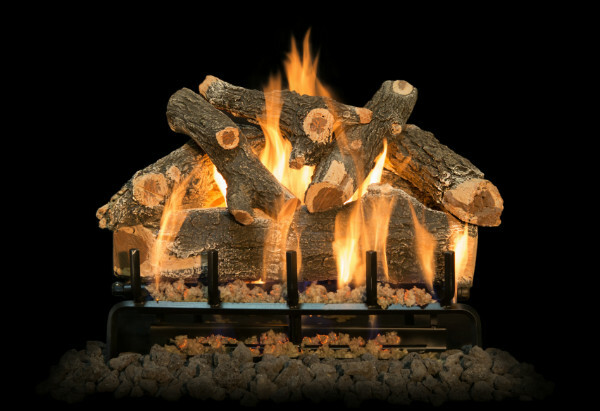 Here are the top 5 ventless gas log sets for 2019!